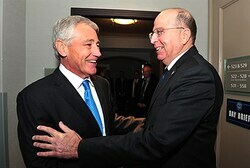 Defense Minister Moshe Ya’alon met US Defense Secretary Chuck Hagel on Saturday during an international security conference. The two discussed cooperation between Israel and the US, as well as recent developments in the Middle East. While Ya’alon caused waves last month when he called US Secretary of State John Kerry “obsessive” and “messianic” in trying to force a peace deal on Israel with the Palestinian Authority (PA), his tone was much more conciliatory Saturday. The same day that Ya’alon was praising Israel-US ties, Kerry was threatening Israel with international boycotts should peace talks fail. Ya’alon noted the Muslim sectarian tensions that are fueling the war in Syria have led to an ongoing genocide with no end in sight, as neither side is managing to get the upper hand. Ya’alon predicted continued bloodshed in Syria for the foreseeable future, arguing a political solution is not currently realistic. The Shi’ite-Sunni divide has been threatening an all-out sectarian war in Iraq as well.